Can Blockchain Technology Solve Today’s Ailing Medical Payment Model (Q&A)? The challenges faced by today’s massive U.S. health system have been well documented — escalating costs, inconsistent care delivery, patient access barriers, to name a few. Healthcare is a highly siloed and regulated business, one that makes overcoming barriers to quality and efficiency a monumental undertaking. Moreover, insurance companies and other third-party stakeholders often pursue strategic aims that run counter to the needs of the individual patient. As a result, the average everyday healthcare consumer has little or no influence or control when it comes to managing their own health. One approach which is gaining momentum in some healthcare industry circles is self-directed healthcare. The aim here is to provide patients with greater freedom over their care delivery choices and associated costs by relieving them and their providers of unnecessary administrative burdens present in the current system. One such company following this model is a Blockchain-centric project seeking to reshape the healthcare landscape for both health service providers and individuals through a free-market, self-directed approach. Known as Universal Health Coin (UHC), this public benefit corporation in the midst of launching an anonymous, token-based healthcare system that employs Blockchain technology to arbitrage, decentralize, fund and provision a new health payment model in the U.S. and ultimately worldwide. The UHC in other words would serve as a utility token for healthcare expenditures. Co-founder Gordon Jones was raised the son of a Physician-Executive. After graduating from The Citadel and serving two tours in the 82nd Airborne Div USA, he earned his Masters and Doctorate in Health Administration from the Medical University of SC. Dr. Jones’ 25 years of digital health innovation, entrepreneurship, and business development experience has given him a unique perspective on how to foster meaningful shifts in the current healthcare landscape. 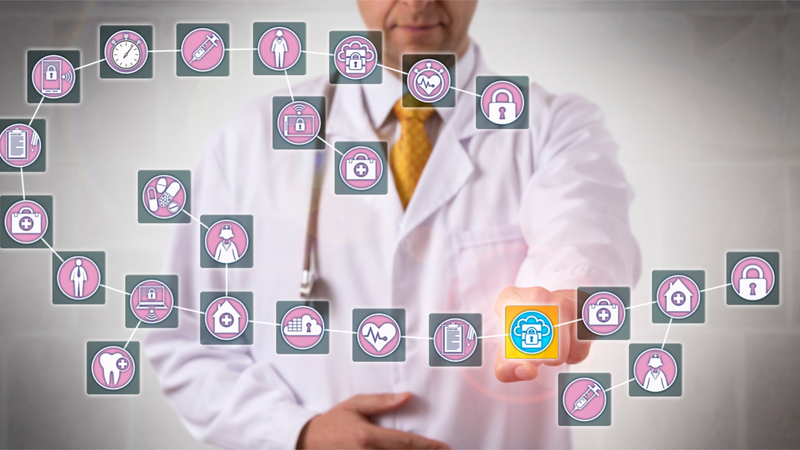 In this exclusive interview for Blockchain Beach, Dr Jones explores advancements on the Universal Health Coin roadmap intended to foster a new era of Blockchain based medical payments. GJ: My business partner Courtney Jones (no relation) who I met at a conference last spring had been working in Blockchain since 2013, but not in healthcare. One of the first questions he asked me was: “if you were to put anything in healthcare on the Blockchain, what would that be.” I hadn’t really thought about that question before so I did some research. BB: What did you come up with? GJ: I got back with him and said, “look, all of these other entities and people who have written white papers are all thinking about how to enable current, legacy healthcare systems with Blockchain (i.e. the submission of claims, the electronic health records, the health information exchange, etc). All of that is tied to the prevailing system which is part of the problem. BB: So what was the epiphany? GJ: We determined that the payor ultimately drives everything. So the genesis of UH is tied to our belief that a new payor model is badly needed. GJ: The template for this has long been in place, even before insurance was created — one where people could come together and share the health cost burden. Today, they are called Health Cost Sharing Ministries. We have 104 in existence here in the U.S. with a half a million people participating in these programs. They are mostly faith based and depend a lot upon trust, because there is no real contract between the people in terms of their monthly contribution except for their promise to do that. But the system works. BB: So how does UHC propose to tie the Blockchain into this? GJ: The fundamental structure of Blockchain is to create trust between disparate parties. So I think Blockchain is the ideal technology for us to take the health cost sharing model and expand it beyond faith based organizations to everybody. So that’s what I came back to Courtney (Jones) with, the thought of creating our own decentralized health cost sharing program utilizing the Blockchain. BB: So in a sense, are you saying that each consumer would have a Health Saving Account on the Blockchain? GJ: In part. Let’s say for example that we have a million members and let’s say that each of them is paying an average of $200.00/month. So we have 200 million network dollars that month to spend on health costs for the membership. And let’s say that at the end of the month we’ve only spent 190 million. A portion of that two million dollars which is left over would remain in everyone’s wallet. That 5% of the $200 million that remains in everyone’s wallet in what we are referring to as the health savings account. Because this amount is individually managed and owned, we just call it a health savings account, but its not “quote and quote” an HSA. GJ: It really isn’t. The consumer won’t need to know anything about Blockchain and cryptocurrencies. When we start marketing, we are going to look just like the cost sharing program MediShare or an insurance company just marketing directly to the consumer. BB: So UCH functions as a health sharing program? GJ: That’s correct. Because we’ll be able to reduce the participant’s cost for medical services compared to a fully insured program. They will not be required to go to any specific network. And because we will not be enrolling healthcare providers into some sort of network, members will have the freedom to go to their personal provider and introduce the concept to them. BB: Do smart contracts fit anywhere in this model? GJ: Yes. The provider through our model can agree to a smart contract to get paid a fair payment for a specific medical service. They can then advertise that they’re accepting UHC which allows any of our members to visit that doctor at those rates. The UHC just simply facilitates the transaction. BB: Does the doctor though have the option of being paid in cash? GJ: Absolutely! In addition the doctor can elect, let’s say they have 20 employees, if they want build up some UHC in their wallet in order to cover the cost of healthcare for their 20 employees We’ll enable them to be able to do that. Or, again, they can convert it to cash or even bitcoin and put it in a payment system to use however they want for operational costs, such as internal supplies. At the end of the day our goal is to have UHC become the currency for not only the provision of health services but also use on the medical supply chain. BB: And how you plan to use the digital currency, NEO? GJ: That’s where we plan to employ the smart contracts. It will allow us to tie our token to the price of NEO but we won’t be using it for the payment. By way of example, let’s say that a members wants to pay in NEO instead of cash. In this case they can put NEO into their UHC wallet. It will then get converted into UHC because that token is what works for our system. BB: But what about concerns about transaction times? GJ: Yes, that’s a concern for sure and the very reason we’re looking at EOS. Because at present Ethereum can only do 15 transactions per second. So their system seems to be getting bogged down. NEO can do 10,000 transactions per second. But EOS is touted as being able to do 1 million transactions per second. BB: Sounds like much work remains with this? GJ: Let’s just say that we are studying all of our options at this point. We could even ultimately have some capabilities on NEO, some capabilities on Ethereum, some capabilities on IBM. It all depends. BB: Any early use cases on the horizon for the UHC concept? GJ: There’s an association of over 6,000 employers that has an average of 10 employees per employer, that’s interested in piloting UHC when we have it ready. Our plan is to build a program specifically for them and then they will actually be able to market and brand their own cost sharing program built on UHC. GJ: Ultimately our goal here at UHC is not to promote Blockchain culture. We’re here for individuals that want a low cost option that functions in a more health oriented way. That’s where our time, energy and attention is fully targeted at present. Michael Scott is a contributor to Blockchain Beach, specializing in the areas of blockchain technology, cryptocurrency and digital cities.